On August 26, 1887, the Baltimore Orioles started a three-game American Association series with the Cincinnati Red Stockings at Cincinnati Park.1 The second-place Red Stockings came into the contest sporting a record of 58-45, three games ahead of their visiting Baltimore opponents, who were in fourth place at 52-45, but 17 games behind the first-place St. Louis Browns. With the Browns having a firm grip on the top spot through much of the 1887 season, Baltimore and Cincinnati were playing for runner-up. Cincinnati had won eight of its previous 10 games, but Baltimore was seeking to end a five-game losing streak. About 2,000 fans braved Friday afternoon game conditions described as “a cold, raw day, and hard on the pitchers.”2 They were treated to an offensive explosion on a rainy day, an “aggregate of sixty clean bases in one game,”3 as the Orioles bested the Red Stockings, 19-11. 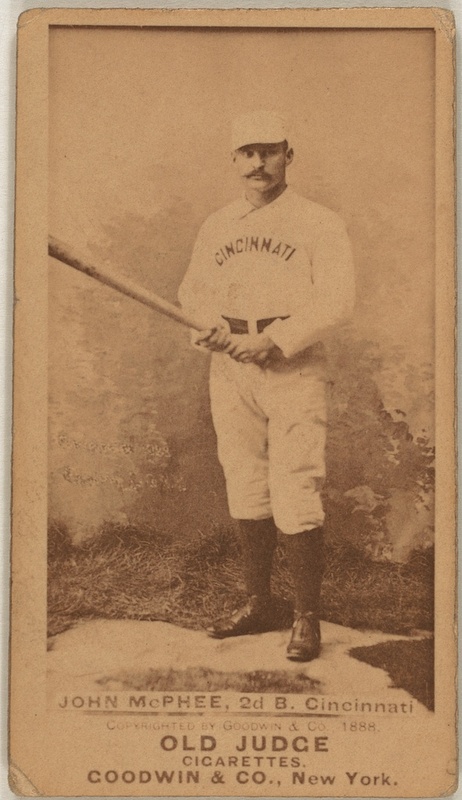 Part of the offensive outburst included Cincinnati second baseman Bid McPhee hitting for the cycle. The scoring happened early and often. Cincinnati batted first.6 With one out in the top of the first frame, McPhee drove “a corking hit to left, which [Joe] Sommer got in front of. It took a mean bound and rolled to the fence, giving Biddy a home run.” Baltimore answered with three runs in the bottom of the first when Bill Greenwood walked, went to third on a passed ball and came home on a Mullane wild pitch. Oyster Burns and Blondie Purcell also scored after getting on with singles. Cincinnati tied the game 3-3 in the top of the second by scoring two runs. McPhee did the damage by launching a triple with two aboard and one out. The Red Stockings added another in the third to lead, 4-3, but then in its half, Baltimore roared back with six runs. The Orioles sent nine batters to the plate and triples by Sommer and Smith highlighted the attack. After three frames, the Orioles were ahead 9-4, and the visitors held the lead for the rest of the game. Cincinnati scored three in the top of the fourth. Hugh Nicol walked and stole second. He came around to score on McPhee’s double. McPhee scored on an error by Purcell that allowed John Reilly to reach. Reilly then stole second and scored on a single by Kid Baldwin. With the score now 9-7 in favor of the visitors, Baltimore sent another nine men to the plate and, after five singles and a triple by Greenwood, had placed five more runs on the scoreboard. McPhee singled in the fifth, giving him another RBI and the cycle. In the first five innings, he had batted four times and had accomplished the rare feat of a batting cycle in reverse natural order, becoming only the second player in history to hit for the cycle with this HR-3B-2B-1B sequence.7 Baltimore responded with another run in the bottom of the fifth on singles by Burns, Jumbo Davis, and Sommer. 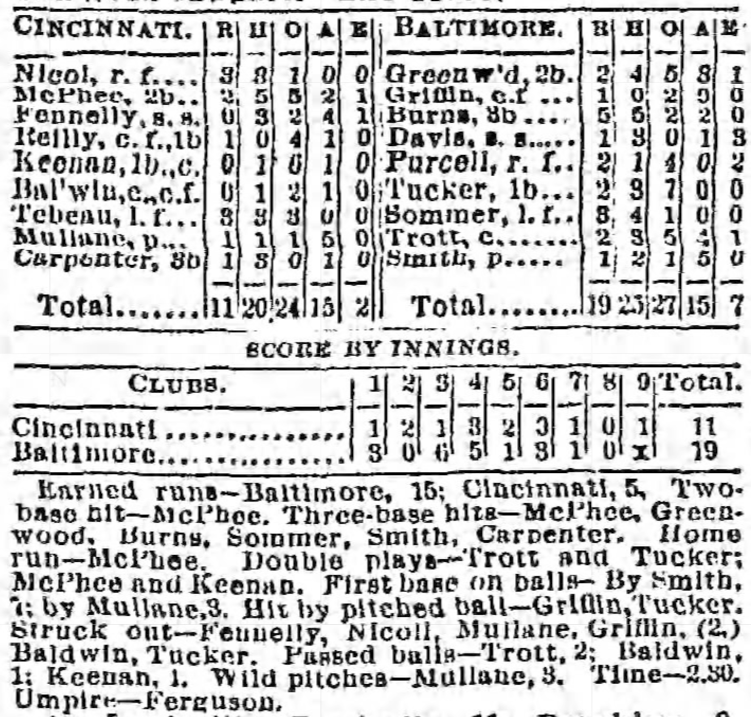 In the Baltimore Sun, umpire Bob Ferguson9 described the contest with, “This game reminds me of how they played ball twenty-five years ago.”10 That would have been in 1862, 14 years before the start of the National League and nine years before Ferguson’s own play in the National Association. This was the 21st time during the 1887 season in which the Red Stockings scored at least 11 runs. (They finished the season with 27 such games.) Baltimore scored 11 or more runs in a game 28 times! Cincinnati and Baltimore battled each other 20 times in 1887, with the Red Stockings winning nine and the Orioles winning 11. The two teams were evenly matched, as Cincinnati scored 137 runs and Baltimore tallied 134 runs in those games.13 The Red Stockings avenged their loss to the Orioles the next day, August 27, with a 15-2 fusillade of their own. In addition to the sources mentioned in the Notes, the author consulted Baseball-Reference.com, mlb.com, Retrosheet.org, and sabr.org. The author thanks Bob Bailey, Peter Mancuso, Tom Ruane, and Jack Zerby for their information on Nineteenth Century practices of home teams batting first (see Note 6). 1 According to Retrosheet, the ballpark was League Park (II), yet the Cincinnati Enquirer referred to it as Cincinnati Park. 2 “Notes,” Cincinnati Enquirer, August 27, 1887: 2. 3 “Hard Hitting,” Cincinnati Enquirer, August 27, 1887: 2. 4 Ibid. A fusillade is “a simultaneous or rapid discharge of many firearms,” according to Webster’s New World Dictionary (New York: Pocket Books, Simon and Schuster Inc., 1995). 6 Tom Ruane of Retrosheet provided the following on June 16, 2017, in response to an email inquiry: The home team had the option of batting first well into the 20th century. We have only sporadic documentation of when that happened but the last time it occurred was on June 25, 1914 (Buffalo-Pittsburgh, Federal League). Peter Mancuso and Bob Bailey of SABR’s Nineteenth Century Committee added on June 19, 2017, that usually only two baseballs were supplied by the home team for an entire game and that the ball was most lively for hitting purposes at the very beginning (also whiter and easier to see). A rule from about 1891 stated that an official game required five innings to be complete, so batting last might save a team from a loss if they never completed their fifth inning when trailing, and home teams overwhelmingly began to choose to bat last. 8 “Notes,” Cincinnati Enquirer, August 27, 1887: 2. 9 Ferguson played professional baseball from 1871 to 1884, primarily as an infielder. He played for teams in the National Association, National League, and American Association. He was also an umpire from 1871 through 1891, officiating 829 games. 10 “The Baltimore Club Wins a Slugging Match from Cincinnati,” Baltimore Sun, August 27, 1887: 6. 11 “Hard Hitting,” Cincinnati Enquirer, August 27, 1887: 2. 13 Both squads finished the 1887 season with respectable records—Cincinnati at 81-54, and Baltimore at 77-58—yet neither would catch the Browns. Cincinnati finished in second place, 14 games out; Baltimore was third, 18 games behind.